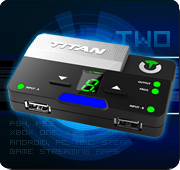 The Titan Two technology translates to a powerful, fully customizable and zero-lag gaming device. 1. Connect the original controller of the console to the USB port labeled Input-B. The original controller for the console may be required for authentication and/or for console specific features, such as headset and chatpad. This step is only required for PlayStation 4, Xbox One and Xbox 360. 2. Connect your preferred controller or any compatible gaming input device to the USB port labeled Input-A. 3. With the provided micro-USB cable, connect the Titan Two Output port to the console or any compatible gaming system. 4. Optional Step. Load the memory slot programmed with Gamepack, GPC Script, Input Translator and/or Binary Macro. 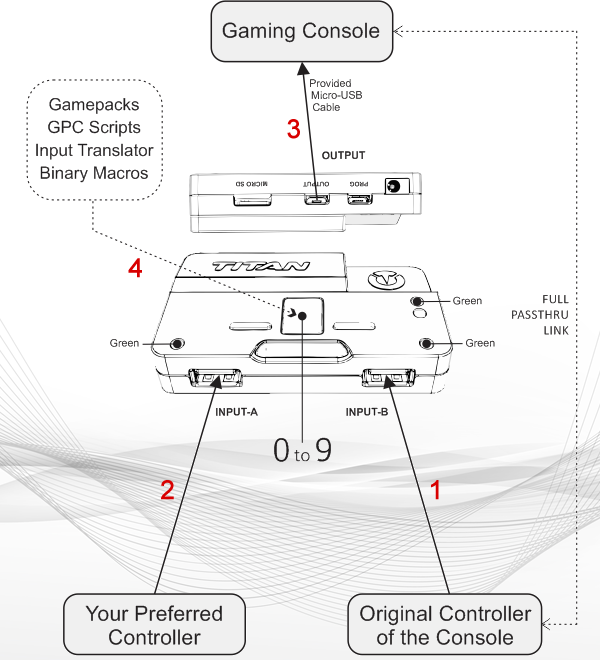 All-in-one gaming device that combines features of dozens of products in a single form factor. 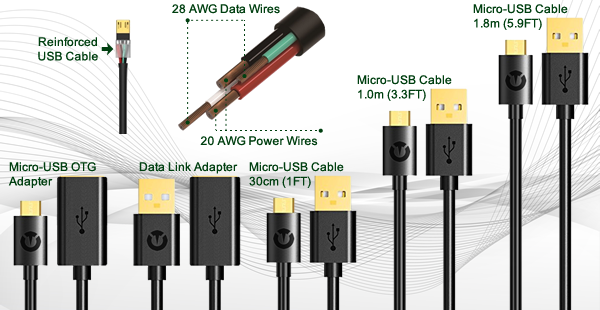 Premium Gold Plated Micro-USB Cable 40cm (1.3FT) long. 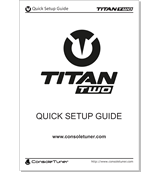 What you need to know to start use the Titan Two device. 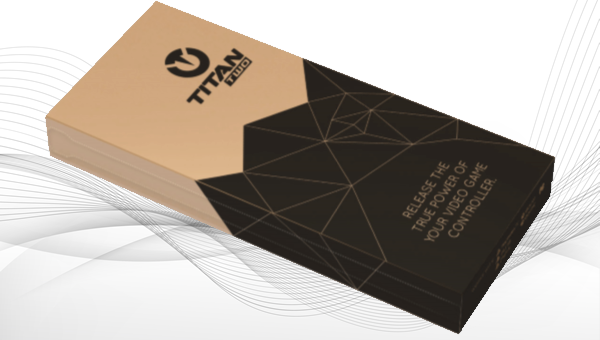 After the manufacturing, assembly and quality control, the Titan Two device is packed in a strong and sealed box, ensuring its contents are protected against impact and vibration that may occorur during the delivery. 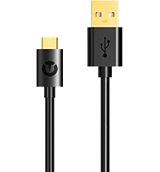 The provided Micro-USB cable is recommended to connect the Titan Two on the console or gaming system, its short length and high quality material ensures good connection and delivery of power to the Titan Two device and plugged gaming controller(s). The provided cable can also be used to update, configure and program the Titan Two device via Gtuner IV software. 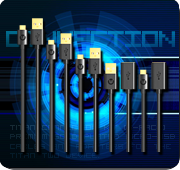 For more options of compatible cables and adapters, check the Titan Connection Kit in the Accessories page. 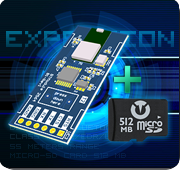 Bluetooth 4.1 Module Class 1.5 Low Latency + Micro-SD Card 512Mb (Sold Separately). 5-Pack Premium Gold Plated Micro-USB Cables and Adapters: 3x Length Cables (30cm , 1.0m, 1.8m) + 1x OTG Adapter + 1x Data Link Adapter (Sold Separately). Power Supply AC 100V-240V to DC 7.5V-2A with 4.0mm x 1.7mm connector (Sold Separately).